After breakfast Dietmar worked on Flight plans, me on washing and mails and a couple of research topics. Late morning we took a complimentary shuttle bus from the resort to Port Douglas to an Indigenous Wildlife Habitat Animal Site to view those Birds and Koalas we have not found in the Rainforest nearby. 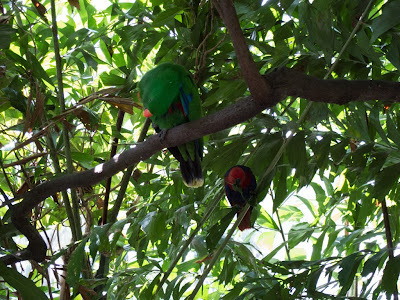 We did not want to leave Australia not having seen a Koala, (which is not a Bear) or an Eclectus Parrot ... going into a man-made Park was the next option. Well, we saw them all. The huge area was devided in three areas, Rainforest, Grasslands and Wetland. 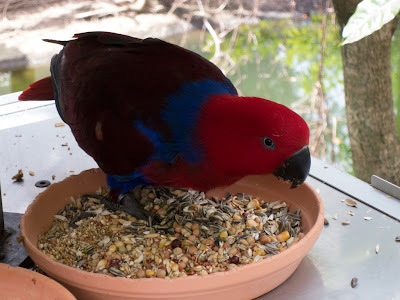 Very nicely done with walkways, the restaurant area full of Parrot-stands and different species of parrots you could hold and socialise with and the wooded and forest area one could go into and observe the different animals. Birds of all kinds flew from tree to tree and we could watch them interact, feed and/or bath in one of the many ponds, waterfalls etc.. 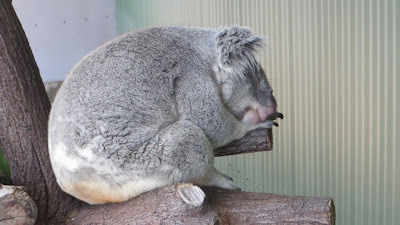 The Koala is a small bear-like, tree-dwelling, herbivorous marsupial which averages about 9kg (20lb) in weight. Its fur is thick and usually ash grey with a tinge of brown in places. 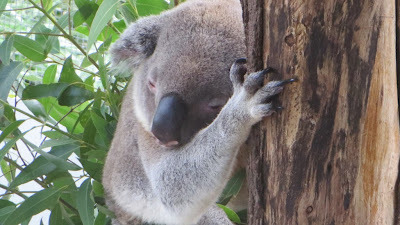 The koala gets its name from an ancient Aboriginal word meaning "no drink" because it receives over 90% of its hydration from the Eucalyptus leaves (also known as gum leaves) it eats, and only drinks when ill or times when there is not enough moisture in the leaves. ie during droughts etc. The koala is the only mammal, other than the Greater Glider and Ringtail Possum, which can survive on a diet of eucalyptus leaves. We learned that a Koala sleeps 20hours, eats or chews leaves three hours out of 24hours. The remaining 1 hour? He hardly ever moves..so we assume he spends the remaining time shuffling around the tree stump. Late afternoon we prepared once more for the next couple of days ahead as we are due to leave very early tomorrow morning leaving Australias east coast to go further west.